Special Pageant Information Included - A Must Read! There are so many things to go to and get done during this season. I know that your calendars look like a solid wall of activity from here until Christmas. We hope that the offerings we have here at St. Mary’s for you will not just be items to check off, but rather opportunities to truly prepare for the incredible joy of Christmas. In this newsletter you will find information about events coming up and materials offered to help us all remain centered on the gifts we have been given already, not the ones on our shopping lists. 12 p.m.: Cake for December birthdays and anniversaries! 10 a.m.: Music Rehearsal and Sunday School classes for children ages 4 years old through 5th Grade. 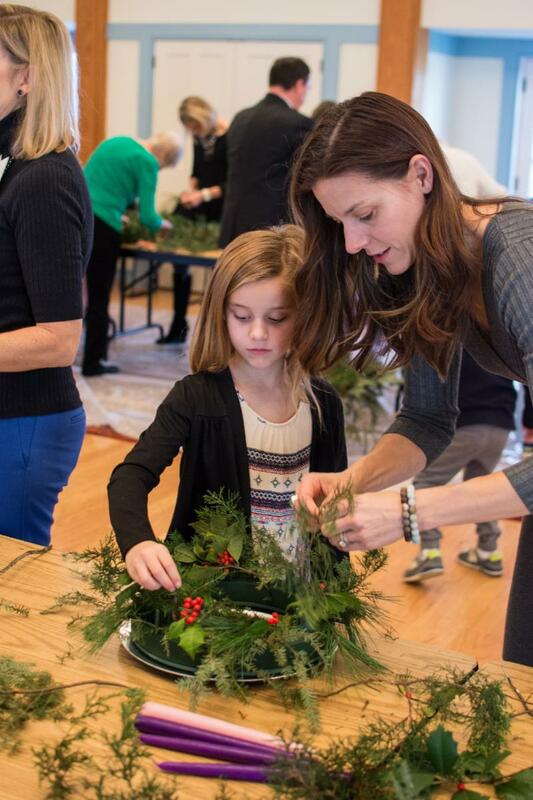 Please plan to cut some greens from your yard and come join in the fun of making Advent wreaths with others in our community. We provide an oasis form, candles and a prayer booklet for you to use at home. Can’t wait to see you there! Those of all ages are invited to join us for an Advent Service of Lessons and Carols this Sunday, December 2 at 5 p.m. in New St. Mary's. It is one of the most meaningful and moving expressions of our great liturgical tradition. Come listen to readings from the scriptures that anticipate the coming of Christ that are coupled with choral music telling of God's promise of salvation. St. Mary's choir is one of the finest choirs in our area. This is a wonderful opportunity to experience their gift of music and to raise your voices in song with them. This year to help you celebrate Advent at home we have two different tools for you to use at home. 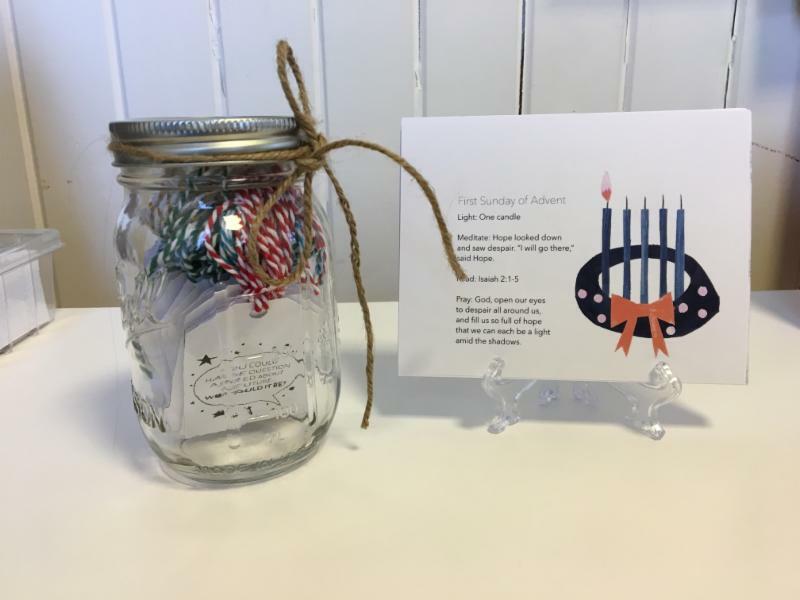 Advent in a Mason Jar is a resource that has tags to pull out from the jar daily (or whenever you can)! There are tags with prayers for each week of Advent, conversation starters, ways to connect, and ways to get moving. The other resource is a small daily Advent calendar with prayers and ideas to help share the season with your family and others. There are a million sites that provide lists and advice on how to “get it all done” during the Christmas season. If you are looking ahead and want to think about ways to slow down and center more on the mystery and gift of Christmas this year, Amelia highly recommends looking into the Giving Manger concept. 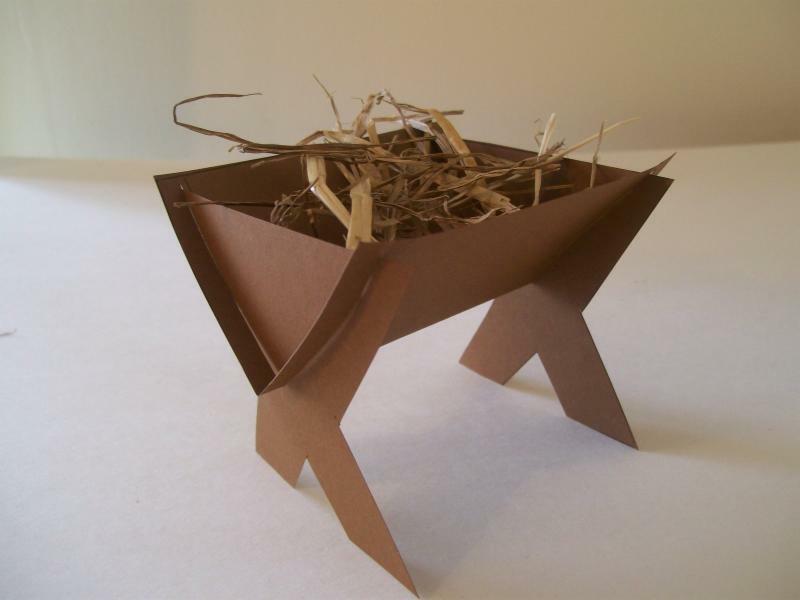 Here is a site that offers a way for families to more intentionally prepare for Jesus’ birth. You do not have to purchase a giving manger to use the concept in your home. We will have our own Popsicle stick mangers available on Sunday, December 2 during the Advent Wreath Making day festivities at 10 a.m. in the New Parish Hall . 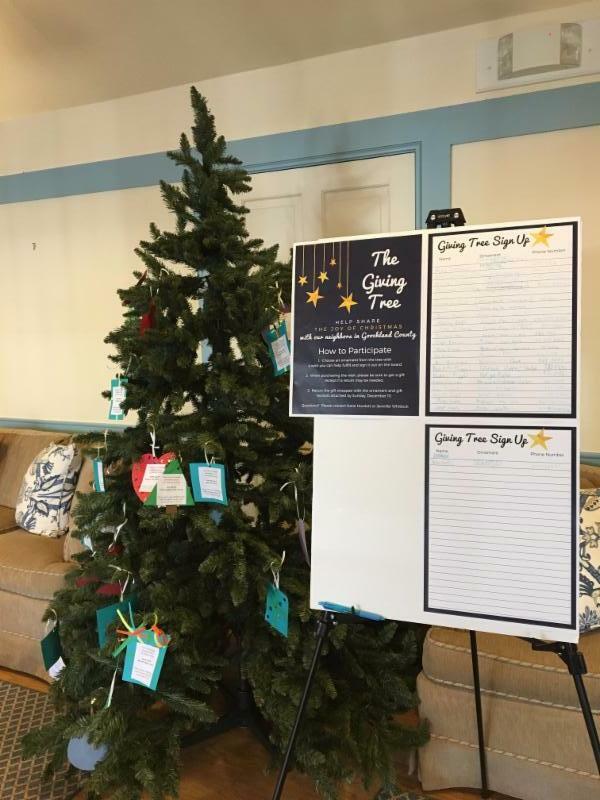 The Giving Tree is now up in the Dover Lounge! 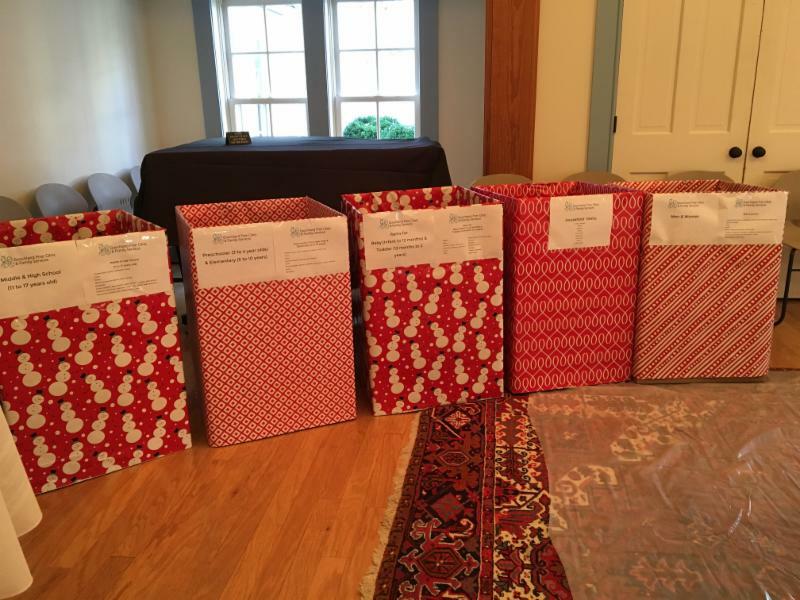 St. Mary's offers the opportunity to provide Christmas gifts for five families from the Goochland Christmas Mother. Please grab an ornament or two with the gift needs on them. There are only a few left! The gifts will be collected by Sunday, December 9. 1. Choose an ornament from the tree with a wish you can help fulfill and sign it out on the board. 2. When purchasing the wish, please be sure to get a gift receipt. 3. Return the gift wrapped with the ornament and gift receipts attached under the tree in the Dover Lounge. GoochlandCares Clothes Closet drive begins this Sunday ! Throughout Advent, St. Mary's is collecting clean, gently used or new items for infants, children, teenagers, and adults. Collection boxes are located in the New Parish Hall. A list of needed items can be found on the table in the Café area. Please bring them in by Sunday, December 16. For further information or if you have questions, contact Ashley Cameron . 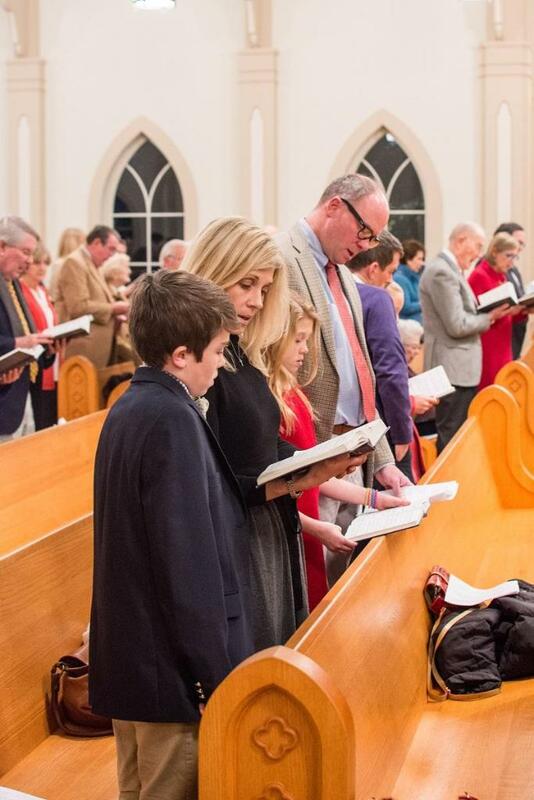 The Christmas Eve service is one of our most beloved traditions at St. Mary’s. 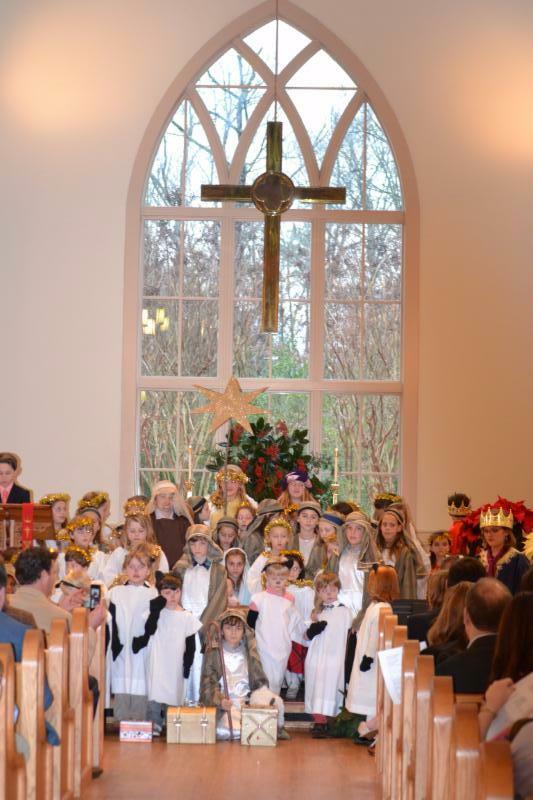 The Children’s Lessons and Carols is held on Christmas Eve at 4 p.m. This year we will follow the retelling of the story of Christmas with a Holy Eucharist. There will be several stations for communion as we do for Easter. Again this year, a Birthday Party for Jesus will follow the service in the New Parish Hall. To sign up your child and to volunteer , follow this link .